Today we learn two lessons: stupid people in wheelchairs and the importance of asking the right question. Over the years, I’ve known three people in wheelchairs. Considering how many wheelchair people there are and considering how old I am, I’ve known surprisingly few people in wheelchairs. There might be a reason for this small number. More on that in a minute. One characteristic common to all three wheelchair people I’ve known is they were all incredibly stupid (definition in a moment). I used to wonder why wheelchairs made people stupid. I pondered that question for many years. Never found an answer. Then, one day I realized I was asking the WRONG question. Yes, there is such a thing as a wrong question. Instead of asking why wheelchairs made people stupid, I should have asked why do stupid people end up in wheelchairs. Eureka! The right question practically answers itself. You see, stupid people end up in wheelchairs because they’re stupid. Simple! Lesson 1: if there’s no answer to your question, you may be asking the wrong question. Lesson 2: a proper question practically answers itself. Now, you might object and say there are reasons other than stupidity for people to end up in wheelchairs. Diabetes might be the culprit. However, many cases of diabetes are caused by being overweight or a lifelong bad diet. And, both of these conditions are caused by stupidity. Or you might say that people end up in wheelchairs because of car accidents. However, I do not believe in car accidents (actually I don’t believe anything). Cars don’t have accidents. Cars crash. Car crashes are caused by stupid drivers either because they do something stupid or they stupidly fail to pay attention to another stupid driver who’s doing something stupid. Just about any reason you can come up with to explain why people end up in wheelchairs ultimately leads to stupidity if you do root cause analysis. Keep asking the question “why” until there are no more answers and you’ve probably found the root cause and the root cause for people in wheelchairs is usually stupidity. There may be exceptions but I’d bet they’re exceedingly rare. The only reasons I can think of why someone who’s NOT stupid ends up in a wheelchair would be extreme old age or a congenital condition. After all, we can’t pick our parents, can we? Today, at the grocery store checkout, my stupid-wheelchair-people-theory was again confirmed. The guy in the next checkout was in a motorized wheelchair. I instinctively avoid getting behind anyone in a wheelchair (because they’re stupid). Anyway, Mr. Stupid’s wheelchair somehow snagged the cable to the credit/debit card reader as he motored through the checkout in a daze. It ripped the cable off thus disabling the card reader. Good thing I wasn’t behind Mr. Stupid because I was planning to pay with a debit card. Now, you might say that hey, Gerold, you’re being really hard on Mr. Stupid because accidents do happen. Ah, you’ve forgotten already: I don’t believe in accidents. Keep reading. As the morbidly obese Mr. Stupid was slowly gathering himself together, the clerk called for help and when he came he said, “Hey, Frank, you busted another one.” Obviously, this wasn’t the first time Mr. Frankly Stupid had pulled this stupid stunt. 1)	Making the same mistakes over and over. 2)	Inability to learn from obvious mistakes. One more thing. 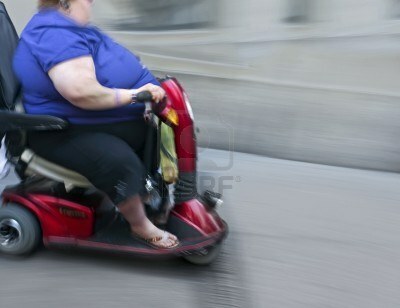 Have you ever noticed how many morbidly obese people are in motorized wheelchairs? Do you think that’s coincidence? I don’t believe in coincidences either. Stupid people in motorized wheel chairs become morbidly obese because the only exercise they get is moving a little joystick or handlebar around. How much exercise is that? If they were smart they’d be in manual wheelchair where they’d at least get some upper body exercise and maybe avoid getting so fat. But, they’re not smart; they’re stupid. Oh, yeah, I almost forgot. The reason I’ve known so few people in wheelchairs after six decades is simply because I avoid stupid people. That’s why I didn’t stand behind Mr. Stupid at the checkout today. 1) A wrong question has no answer but a proper question answers itself. 2) Avoid people in wheelchairs. They’re probably stupid. If you can think of any reason other than stupidity, old age or a congenital condition that puts people in wheelchairs, please leave a comment. This entry was posted in Stupidity and tagged asking the right question, morbidly obese, obese, proper question, root cause analysis, stupid, stupidity, wheelchairs. Bookmark the permalink. If it took you that long to come up with your “theory” then maybe you aren’t as bright as you think that you are? There are reasons other than stupidity for being in a wheelchair and having accidents like the person that you mentioned, like a lack of spacial awareness. That in of itself doesn’t make one stupid. You are judging them solely on the basis of appearance and their lack of spacial awareness. If they are used to being smaller-ie, they lived their life being skinny, and then ended up gaining weight after being confined to a wheelchair because of a medical condition, then it is likely that their spacial awareness would be affected. That is similar to calling a deaf person stupid because they lack the ability to hear, or calling a blind person stupid because they lack the ability to see. Let’s just call a cripple stupid because they lack the ability to walk. No one is good at everything. We all have weaknesses in one area or another. Does that affect our ability to learn? No, it does not. Am I a wheelchair person? No. I hope never to be exactly because of the stigma associated with being wheelchair bound.